Arbline point coordinates can be exported to text files with the .duarb extension. Arblines can also be converted to 2D lines. This is necessary to export volumes along arblines to SEG-Y or dugio. Read about Exporting volumes along an arbline. You can also save arbline data for the active volumes as 2D or 3D data in the Seismix Unix (.su) format. Read about Saving arbline data as a 2D volume (as Seismic Unix file) or Saving arbline data as a 3D volume (as Seismic Unix file). In the Control Panel, open the Arbline tab. In the Arbline tree, right-click the arbline that you want to export and click Export and select 'Arbline'. Type a new file name to export the arbline to the .duarb file format. Note: Only the X and Y points of the arbline are saved in this file and not the trace data. To save the trace data, see below. One or more arblines can be converted to 2D lines. After conversion, volumes can be exported along the 2D line as dugio or SEG-Y. See (Exporting 3D voulmes along an arbline) for details. In the Arbline tab, select the arbline(s) you wish to convert, then right click and choose Export >> Convert arbline to 2D line. Choose either to add the converted line(s) to a New Survey or add them to an Existing Survey. Enter a new survey name e.g. "Converted arblines" and set the trace (CMP) spacing. The converted arbline will be added to the specified 2D survey as a 2D line. The survey can be found in the Survey tab. First, convert the arbline(s) to 2D lines (see Convert arbline(s) to 2D lines). Then go to the Volume tab, right-click on the data volume and select Export. Select the export format: SEG-Y or dugio. 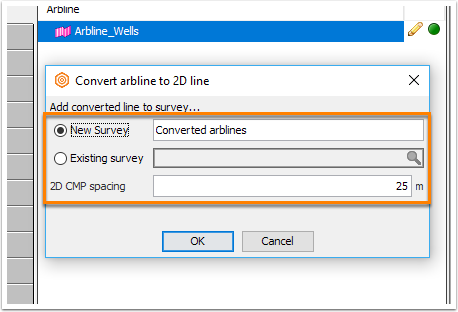 In Survey Extents, select the converted arbline survey. 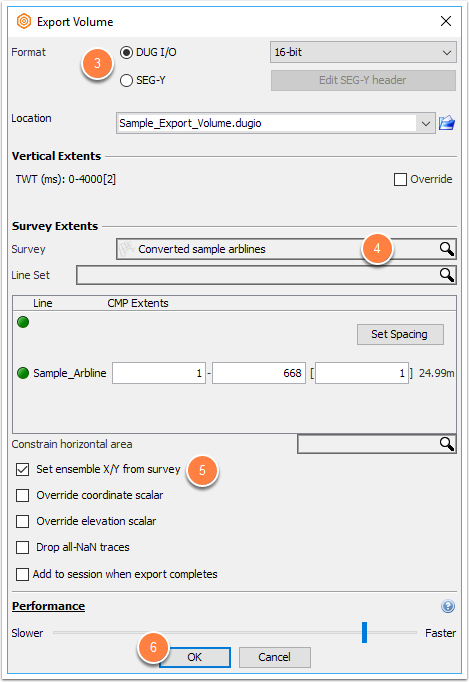 Check Set ensemble X/Y from survey to assign X/Y coordinates to the output. Note: Exporting along an arbline will work for 3D volumes only. Contact support@dug.com for details on how to apply this to 2D volumes. In the Arbline tree, right-click the arbline that you want to save to 2D lines and click Export and select '2D Volumes Along Arbline'. Select a directory to save the 2D lines and click Open. Type a prefix to describe the export and click OK. This will export the arbline data for active volumes to 2D lines in .su format. 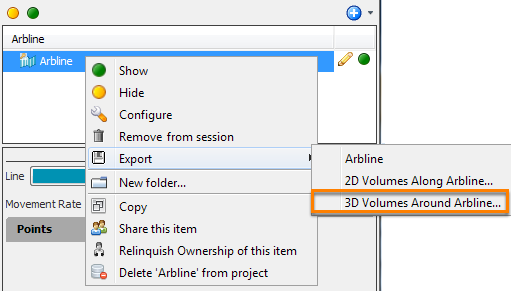 In the Arbline tree, right-click the arbline that you want to save as a 3D volume and click Export and select '3D Volumes Around Arbline'. Select a directory to save the 3D data and click Open. Type a prefix to describe the export and click OK. 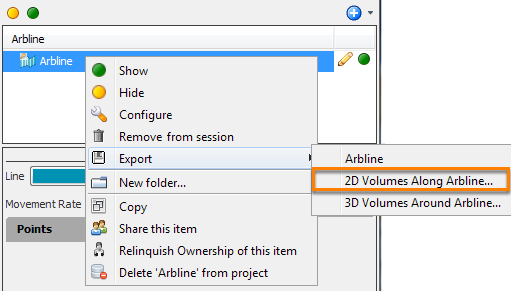 This will export the arbline data for active volumes to a 3D volume in .su format.